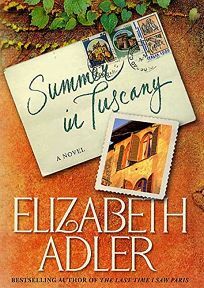 Veteran novelist Elizabeth Adler (The Last Time I Saw Paris) returns to the Continent with Summer in Tuscany, a cute and painfully predictable romance. Frumpy ER doctor Gemma Jericho is divorced, pushing 40 and none too happy about it. Her mom, Nonna, persuades Gemma and Gemma's 14-year-old daughter to travel to Italy when Nonna learns she has inherited an old villa. But when they get there, another American, roguishly handsome Ben Raphael, has already claimed ownership; of course, romance blooms as they wrangle over the property. Gemma alternately gripes, swoons like a teenager and consumes a lot of gelato; locals behave colorfully; and everyone is paired off neatly at the end. Author tour.